Gulf Fritillary butterflies are some of the most striking seen in the Arizona low desert - and some of the easiest to attract. 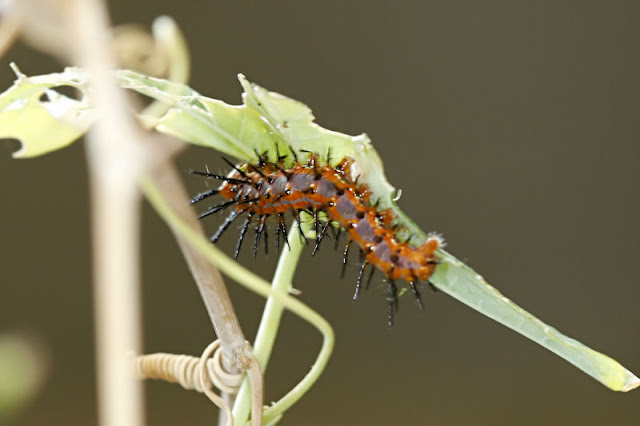 Simply plant a passion flower vine (Passiflora species) of any sort - native or otherwise, and it is almost guaranteed that you'll have Gulf Fritillary's flapping around it within a couple of weeks (provided it is not the middle of winter). 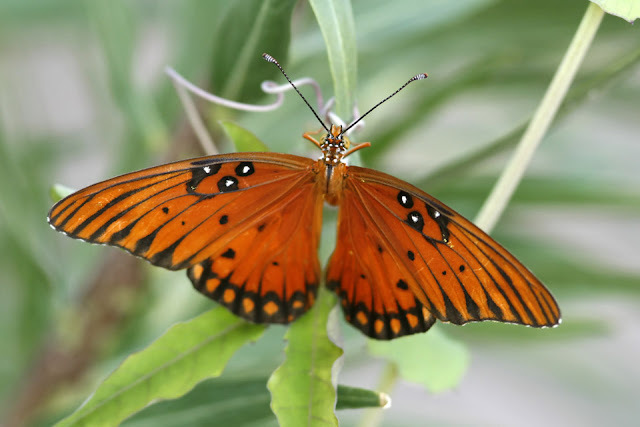 The Gulf Fritillary loves passion flower vines so much because it is the food source for their larvae (see Growing Success in Desert Butterfly Gardening). This is one of those circumstances where planting the larval food source of the species is more likely to attract it than planting adult food sources. They love passion flowers so much that it is common for so many caterpillars to hatch that they literally eat the vine until no leaves remain, ultimately killing the vine. Passifloras generally do quite well in the Phoenix and Tucson areas, but they are not cheap. For the good of the plant and for the good of future Gulf Fritillary generations, gardeners often have to selectively remove caterpillars to keep the plant alive.